When the scaffolding came down off the fresh new Ritz-Carlton back in 1996, local Singaporeans fell head over heels for the starkly angular block designed by Kevin Roche and Pritzker Prize laureate John Dinkeloo, the incredible views of Marina Bay from the rooms, and its glorious collection of pieces by Henry Moore, Frank Stella and Dale Chihuly. 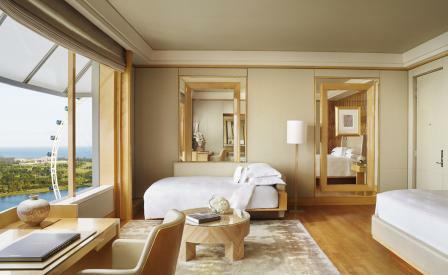 Extensive refurbishments in the following years have kept the hotel in pristine nick, but the recent spruce up of the 32nd floor Ritz Suite by interior designer Terry Hunziker is the hotel’s latest salvo to keep up with the Joneses – its neighbours include the Mandarin Oriental, the Conrad, and the Pan-Pacific. The result is a penthouse clad in light woods, leather and marble that fairly floats over Singapore’s Ridley Scott-like skyline of water and skyscrapers, with the best view to be had from the two-metre long Jacuzzi bathtub. A masculine family room stocked with game consoles and vast sofas can be converted to a second bedroom, while the dining room comfortably seats ten for power lunches. The cost of the refurbishment has been kept under wraps, but a clue can be picked up from a scan of the original works by Andy Warhol and Damien Hirst, the lighting by Christian Liaigre, Miele kitchen appliances in the pantry, and the miles of leather and marble finishes. It’s the high life.